New York Times bestselling author Jeffery Deaver returns with his next blockbuster thriller featuring forensic detective Lincoln Rhyme. Amelia Sachs is hot on the trail of a killer. She’s chasing him through a department store in Brooklyn when an escalator malfunctions. The stairs give way, with one man horribly mangled by the gears. Sachs is forced to let her quarry escape as she jumps in to try to help save the victim. She and famed forensic detective Lincoln Rhyme soon learn, however, that the incident may not have been an accident at all, but the first in a series of intentional attacks. They find themselves up against one of their most formidable opponents ever: a brilliant killer who turns common products into murder weapons. As the body count threatens to grow, Sachs and Rhyme must race against the clock to unmask his identity–and discover his mission–before more people die. A former journalist, folksinger and attorney, Jeffery Deaver is an international number-one bestselling author. His novels have appeared on bestseller lists around the world, including the New York Times, the Times of London, Italy’s Corriere della Sera, the Sydney Morning Herald and the Los Angeles Times. His books are sold in 150 countries and have been translated into over twenty-five languages. The author of over thirty novels, three collections of short stories and a nonfiction law book, he’s received or been shortlisted for a number of awards around the world. His The Bodies Left Behind was named Novel of the Year by the International Thriller Writers Association, and his Lincoln Rhyme thriller The Broken Window and a stand-alone, Edge, were also nominated for that prize. He has been awarded the Steel Dagger and the Short Story Dagger from the British Crime Writers’ Association and the Nero Wolfe Award, and he is a three-time recipient of the Ellery Queen Readers Award for Best Short Story of the Year and a winner of the British Thumping Good Read Award. The Cold Moon was named the Book of the Year by the Mystery Writers Association of Japan, as well as by Kono Mystery Wa Sugoi magazine. In addition, the Japanese Adventure Fiction Association awarded the The Cold Moon and Carte Blanche their annual Grand Prix award. 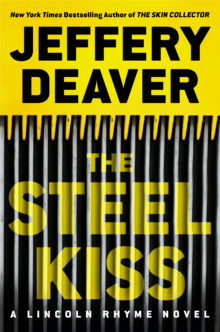 Deaver has been nominated for seven Edgar Awards from the Mystery Writers of America, an Anthony Award and a Gumshoe Award. He was recently shortlisted for the ITV3 Crime Thriller Award for Best International Author. He was born outside Chicago and has a bachelor of journalism degree from the University of Missouri and a law degree from Fordham University. We will pick the winners on May 13th.